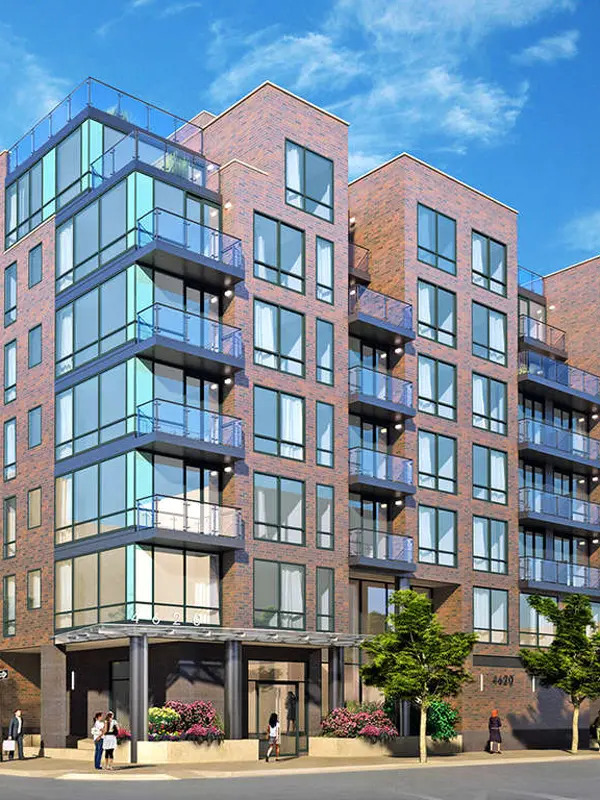 This attractive, 7-story building at 46-20 11th Street in Long Island City is due for completion in 2019 by the Chatham Development Company and the New York Lions Group, which acquired a two-story warehouse on the site in 2016 for $9.8 million. Raymond Chan is the architect. Edge 2 Architecture is the interior designer. The building is known as The Bond. A landing for the East River Ferry is three blocks away. A jaunty mid-rise condominium apartment building in Long Island City that is a short walk from Murray Park and the East River waterfront. It is also close to the Hunter's Point South Park. The red-brick building has an asymmetrical façade on 11th Street with three turrets, three recessed balconies, some corner windows and some setbacks. The building has a part-time doorman, 24-hour virtual doorman, 23-car garage, an attended, double-height lobby, a fitness center, a garden and bicycle parking. Apartments have 5-inch-wide plank oak floors, Toshiba heating/cooling systems, smart door locks, and Bosch washers and dryers. Kitchens have Egger cabinetry, and quartz countertops and backsplashes and Bosch stainless steel appliances. Baths have Egger Grey Bardolino Oak vanities and heated floors. Apartment 2A is a two-bedroom unit with 1,025 square feet. an 18-foot-wide great room with open kitchen. Apartment 2G is a two-bedroom unit with 844 square feet and a 22-foot-wide great room with an open kitchen. Apartment 2F is a one-bedroom unit with 702 square feet and a 17-foot-long living/dining room with an open kitchen. Apartment 5F is a one-bedroom unit with 615 square feet of interior space and 52 square feet of external space with a 15-foot-long living/dining room with an open kitchen and a 10-foot-wide balcony.